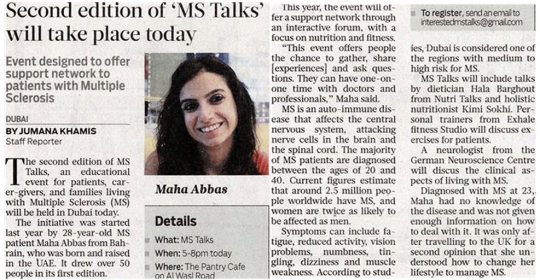 Dubai | Gulf News: Another edition of ‘MS Talks’, an educational event for patients carergivers, and families living with Multiple Sclerosis (MS) will take place on February 6 at The Pantry Café on Al Wasl Road. The awareness initiative was started in 2015 by 28-year-old MS patient Maha Abbas, from Bahrain, who was born and raised in the UAE, and it attracted over 50 people in its first edition. This year, the event is designed to spread knowledge and offer a support network to patients through an interactive forum, with the focus on nutrition and fitness. “For those who have been diagnosed or are suffering from MS, this event offers the chance to gather, share [experiences] and ask questions. They can get more information and have one-on-one time with doctors and professionals,” said Maha. MS is the most widespread disabling neurological condition amongst young adults around the world, with the majority diagnosed between the ages of 20 and 40. Current figures estimate that around 2.5 million people worldwide have MS, and women are twice as likely to be affected as men. The auto-immune disease affects the central nervous system, attacking nerve cells in the brain and the spinal cord. There are different types of MS and researchers still don’t fully understand the causes or progression of the disease. Symptoms can include fatigue, reduced activity, vision problems, numbness, tingling, dizziness and muscle weakness. According to studies, Dubai is considered one of the regions with medium to high risk for MS.
During MS Talk, a number of speakers will share their experiences on the topic, including dietician Hala Barghout from Nutri Talks and holistic nutritionist Kimi Sokhi, who will discuss their research on managing the disease through changes to diet. Personal trainers, from Exhale fitness Studio, will explore the types of exercises patients should focus on, and the importance of building core strength. 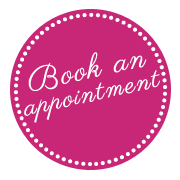 A neurologist from the German Neuroscience Centre will also be at the talk, discussing the clinical aspects of living with MS, and hosting a doctor’s corner where patients can seek professional advice one-on-one. With the public’s positive response to last year’s event, Maha said the sense of community between patients has encouraged her to hold another edition this year and thereby offer a range of practical advice to help MS sufferers achieve the best possible quality of life. “I know first-hand how isolating it can feel without adequate support and the fact that MS varies from patient to patient makes it harder. My goal is to bring people together and it means a lot to know that we are doing something useful for patients,” added Maha. Diagnosed with MS at 23, Maha said she had no knowledge about the disease and was not given enough information on how to deal with it. After travelling to the UK for a second opinion, she was able to better understand the changes she needed to make to manage MS.
“What triggered MS for me was related to lifestyle, nutrition, and habits such as working long hours, and having an unhealthy diet. I soon realised I had to change my diet and stick to anti-inflammatory foods that are rich in Omega 3, such as salmon, avocado, and nuts. Of course, the notion of cutting out red meats after 23 years was unreal, but I soon adjusted,” she said. Hoping to hold more events to support MS sufferers, Maha’s upcoming event will take place between 5pm-8pm.